Standard & Poor's Ratings Services affirmed the U.K.'s sovereign credit ratings Monday, but said its outlook remains negative. The pound sterling slipped against the dollar on the news. S&P's outlook has been negative since May 2009. 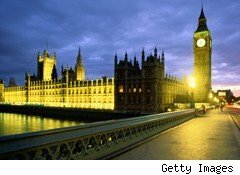 S&P affirmed the U.K. government's long-term sovereign credit rating at 'AAA' and its short-term rating at 'A-1+.' The negative outlook, meanwhile, means S&P puts the probability of a ratings downgrade at one-in-three over the next six to 24 months, S&P said in a statement. But that hardly means the U.K. is on its way to debtors' prison, the ratings agency said. "The ratings on the U.K. are supported, in our view, by the country's wealthy and diversified economy, ample fiscal and monetary policy flexibility, and relatively adaptable product and labor markets," S&P credit analyst Trevor Cullinan said in the statement. Additionally, S&P said the U.K. has deep capital markets with "strong demand for long-dated [sovereign debt] by domestic institutional investors."